Its good to know that your efforts to include food safety instructions in all recipes will pay off . 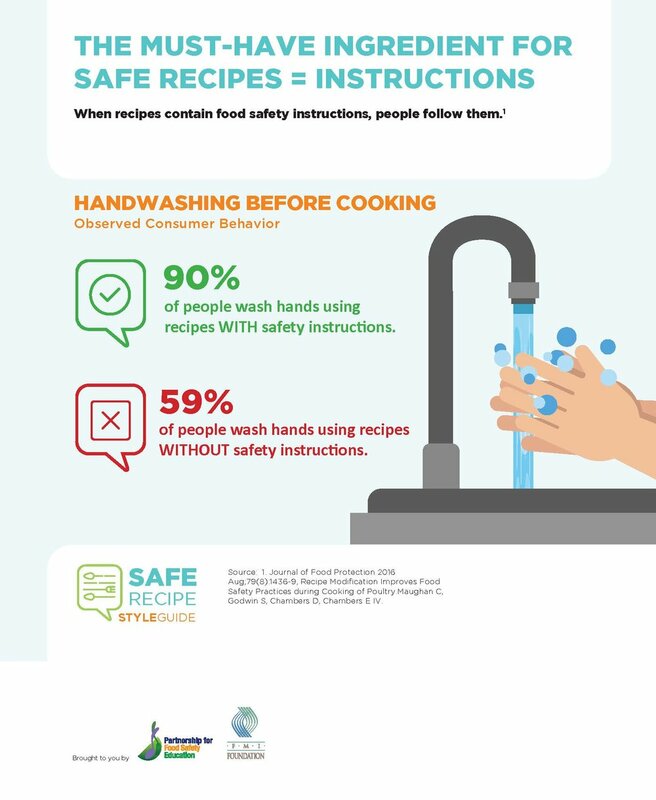 According to The Partnership for Food Safety Education’s SafeRecipeGuide.org, multiple studies show that when consumers follow recipes that incorporate basic food safety instructions, they significantly increase food safety behaviors. And although these studies were conducted with home-based chefs it makes sense that professional kitchens would get the same results. What food safety instructions should you always include in your recipes? Temperature: Always include a final cooking temperature. Be sure to use the temperatures required in your state food code. Federal food codes and organizations such as the FDA may use different temperatures. Reminders for holding and reheating temperature are important as well. Hand Washing: No-brainer here. Start recipes with a hand washing reminder and then again after handling raw meats, poultry, or seafood. Cross-Contact: Wash (insert cutting board, counter, utensil, serving plate) after touching raw meats, poultry, seafood or eggs). Do not reuse marinades used on raw foods. Do not rinse raw poultry or meat. Produce: Always include instruction on cleaning produce thoroughly. Length of copy is a major concern to many recipe writers. ……the best written recipes are clear in intent but concise in length of text. However, the relevant food safety guidelines should not be omitted for the sake of copy space. Try editing other lines or phrases in the recipe, using abbreviations …..or limiting unnecessary ingredients such as garnishes if space is an issue. Do you have food safety instructions in your recipes? Comment below to share your ideas or ask questions.